Cynthia Iris speaks with US Army Black Hawk pilot Col. Paul Bricker about his take on the special forces mission against Osama bin Laden and why it was successful. The US Army’s Task Force 160 (Special Operations Aviation Regiment/the ‘Night Stalkers’) came into being as a result of the problems and failure of Desert One in 1980 in Iran as the United States tried to rescue the American hostages. What do you think the military has learned since that operation that helped the helicopter assault succeed with the bin Laden raid in Pakistan last week? I’ve never served in the 160th, but I’m relatively familiar with the organization. The senior leadership of the military determined that we needed some special capabilities, some niche capabilities, and one of those capabilities we need is with rotary link aircraft, helicopters. We needed to invest in a small organization, because it’s going to be expensive; helicopters are expensive. We were going to specially recruit and select warrant officers, commissioned officers, and sergeants that are in Army aviation, put them into operational units and, for the most part, not take them out. We developed a bench of incredibly skilled aviators, especially, that can operate at night. That’s why they’re called the ‘Night Stalkers.’ All the forces operate at night. They come out (of those units) occasionally, but to a large degree, because we’re investing in them, because we want them to have the kind of skills that you saw the other night in that operation, you have to keep those folks in an organization like the 160th so that they can maintain those skill sets. One of the other things the Army has done is that they’ve invested in special helicopters that have special equipment on them—and I’m not talking about the ‘low observable’ aircraft. Since I came into Army aviation in 1985, they’ve always had the leading-edge technologies, whether it be in the cockpit, in the airframe, with regard to capabilities. That has benefited the rest of the Army as well, because some of those technologies then cascade into the rest of the army. But their aircraft have always been a little flashier with regard to the capabilities that they bring. They had GPS before anybody had GPS. They had specially mounted weapons systems. They had rescue hoists. They had special armour on the inside of the aircraft. They had forward-looking infrared radar, avoidance radar, air-to-air refuelling probes. This all gave us this great capability that has been called upon on various occasions to put special folks into special places and pull them out. But you can always trace that back to Desert One, where we had, if I’m not mistaken, Marine Corps pilots flying Army helicopters operating off of Navy ships, rallying in the desert with an Air Force aircraft. So when you peel the onion back, we needed these capabilities resident, we needed a certain select unit. So there are Navy units. There are Army units and there are Air Force units. And to a large degree, they all have their own training and selection programme. 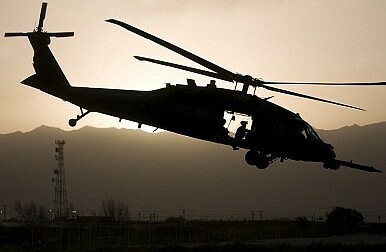 As an aviation commander, I had 155 helicopters in Southern Afghanistan last year, and about 3,200 folks. Some of my warrant officer aviators and NCOs were assessed and were selected to go fly in the 160th, and they’re flying in the 160th today. It doesn’t surprise me that they (the Night Stalkers) were able to do what they did in the raid. They do a lot of things every single night in Afghanistan and Iraq that people never hear about. Admiral Mike Mullen’s warning that Pakistan is using extremism as an instrument of policy marked a major change in US tone. Will Pakistan respond? How the US Should Exit AfghanistanHow to Solve AfghanistanGeneral Petraeus’s October SurpriseJaish-e-Mohammed: Under the HoodAfghanistan-Pakistan Border: Back to Politics as Usual?